Employer Verification Forms are tools used by company owners to verify employment information of employees in their workplaces. Ideally, the preliminary goal of these forms is to provide accurate, up-to-date information about a firm and its employees, and the only people responsible for filling out these forms are the employers of the enterprise. There are many Verification Forms and the type you choose to use depends on the information you would like to provide. Following is the list of the top employer verification forms that you can use to provide the necessary information about employment. A Wage Verification Forms is used to fill out and approve the amount of money that should be paid to employees after every month. The sample form template is free to download, free to use, and easy to fill out. It is important to understand that the Employer Income Verification form is a document that reveals the amount of money your business earns every month. It is the best tool to use when you want to determine the amount of tax to pay to the authority every month. An employer review and verification form is a document that you can download and use for free. The sample form template is ready for print, which means you do not have to edit the layout at all. Moreover, it is easy to fill out. You may also see Employment Verification Forms. 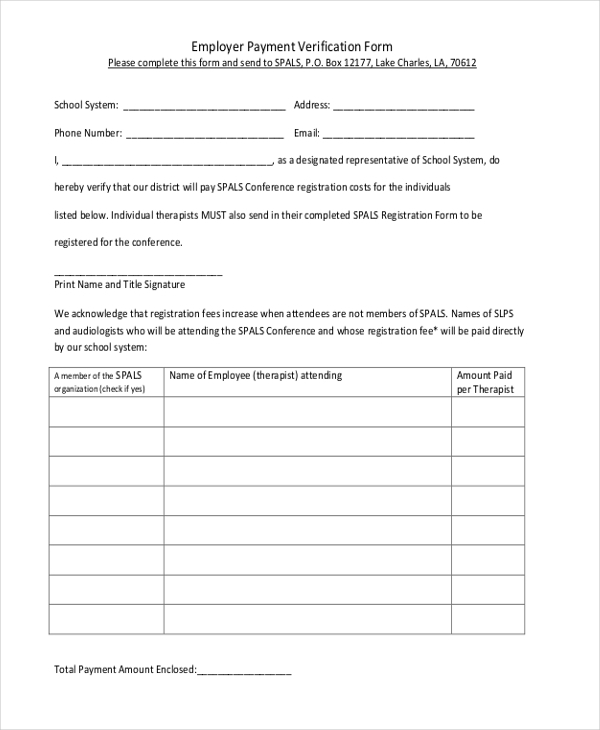 If you want to become a full-time employer registered and authorized to run the local government, this will be the best form to fill out. You can download the template for free and use it exactly as is without really altering the design. Some spouses love it when they work together for the same company. If your company has strict employment policies, there may be a need to verify or deny couples working together for the same company. 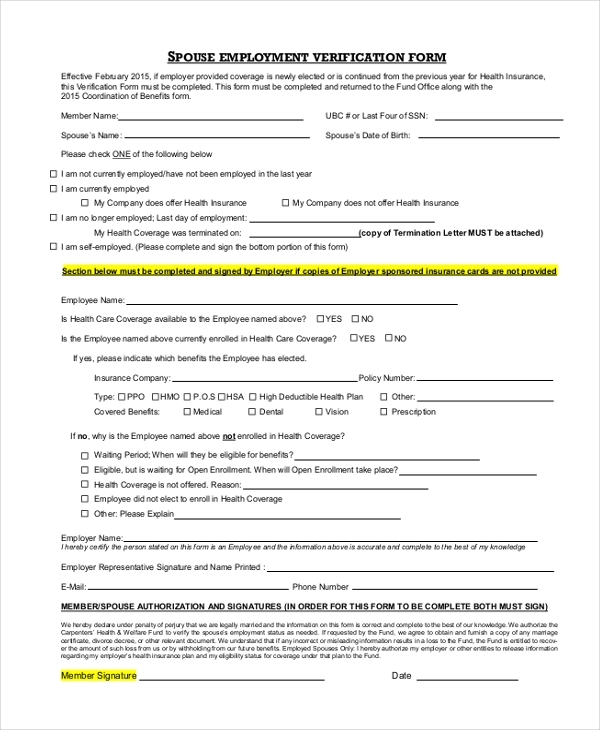 If you would like to verify that the couples have the right to work together, use this form. 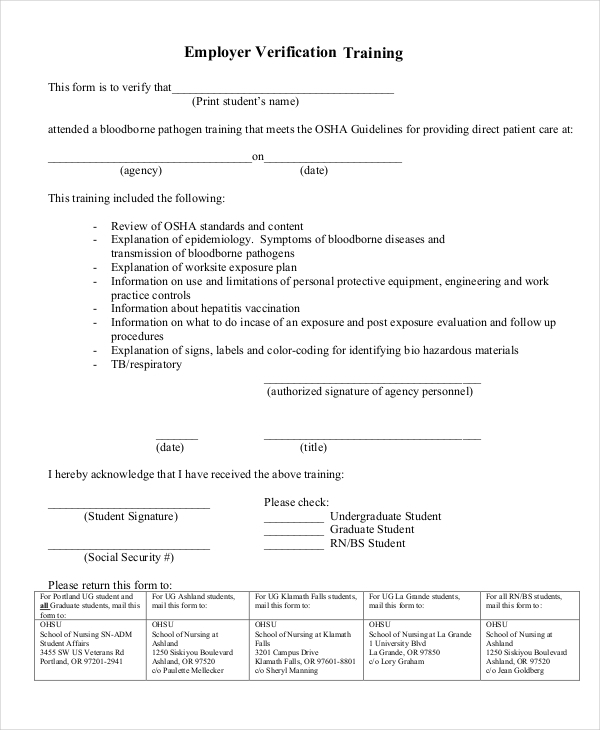 An Employee Training Verification Form is a document signed by an employer to give the go-ahead for a training conference or session. The purpose of the training is almost always to equip employees with the right skills to keep up with the up to date policies of the enterprise. 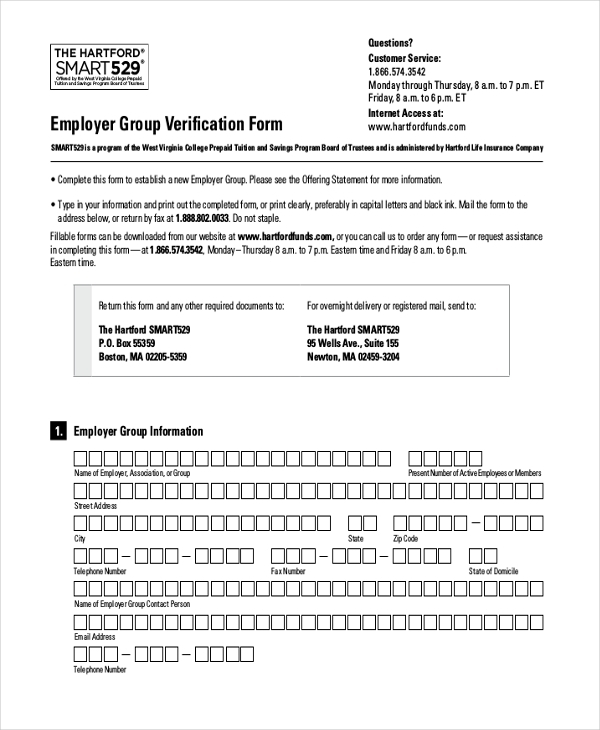 If you are looking for a suitable group verification form that you can use for easy verification, you might find this template useful. 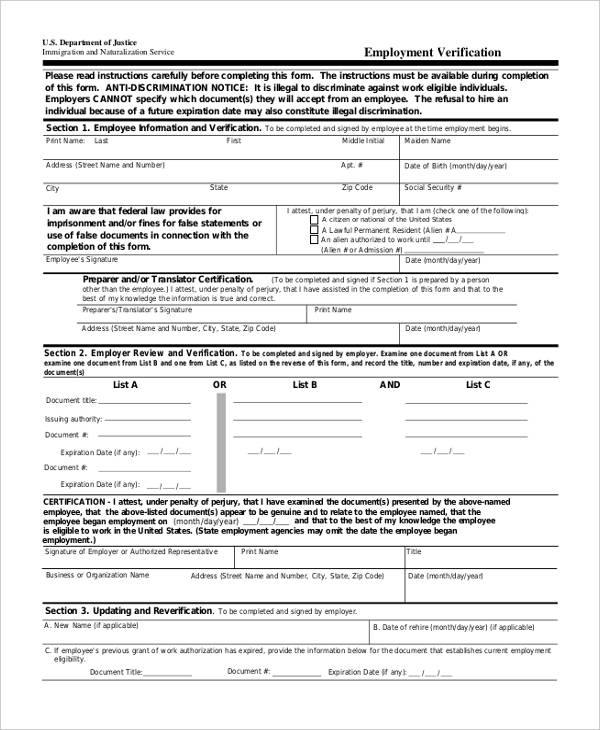 The form template is readily available for free download and it is usually easy to fill out. The payment verification form is a document filled by an employer and given to an employee to notify the worker that their payment of an amount X for the given month Y was already made to the respective account of the employee. 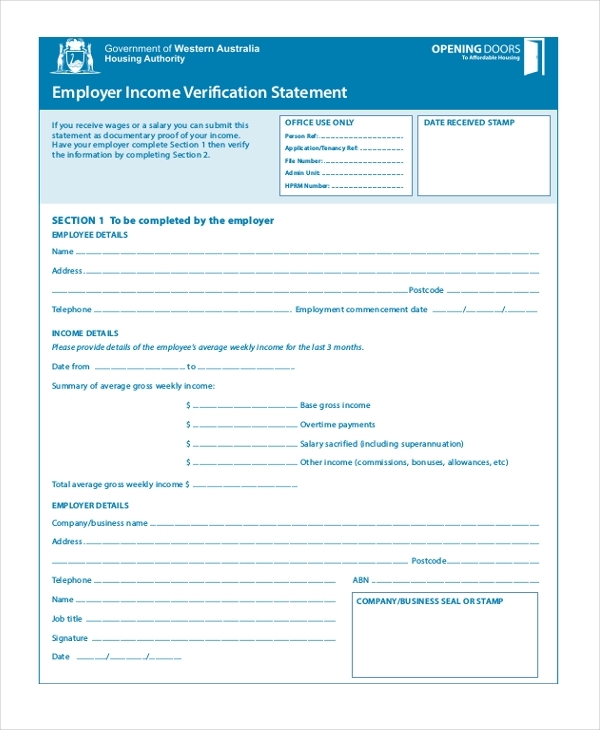 This the form filled by employers to verify the earnings of their business. The preliminary purpose for the verification is almost always to determine the amount of tax to pay to the revenue authority whenever necessary. Because there are many employment verification forms on this list, it is obvious that they have different functions. For example, an employer verification form of earning has a completely different function as opposed to employer registration form. Therefore, the form you choose to use depends on what you would like to use. You can also see Work Verification Forms. 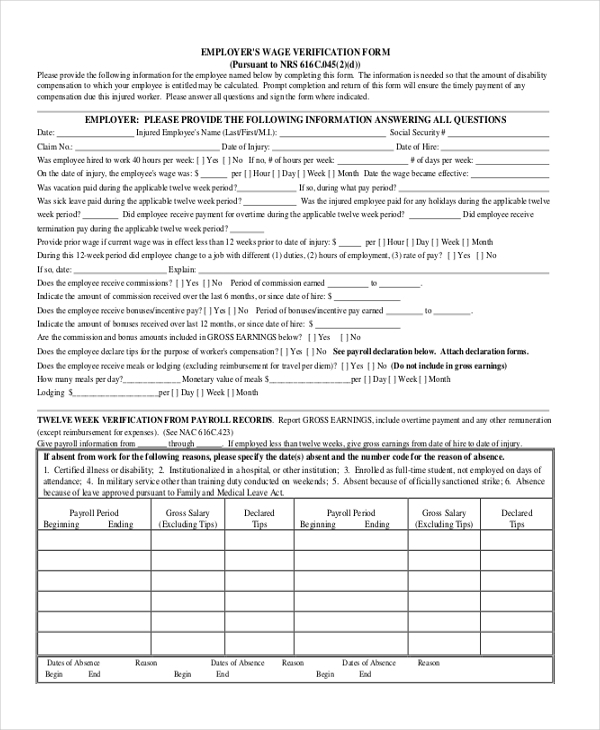 Who Uses these Employer Verification Forms? It is important to understand that these forms were designed purposely for the local authorities and the people who take care of work-related issues. Moreover, employers can also use them to provide evidence of status when the need arise. 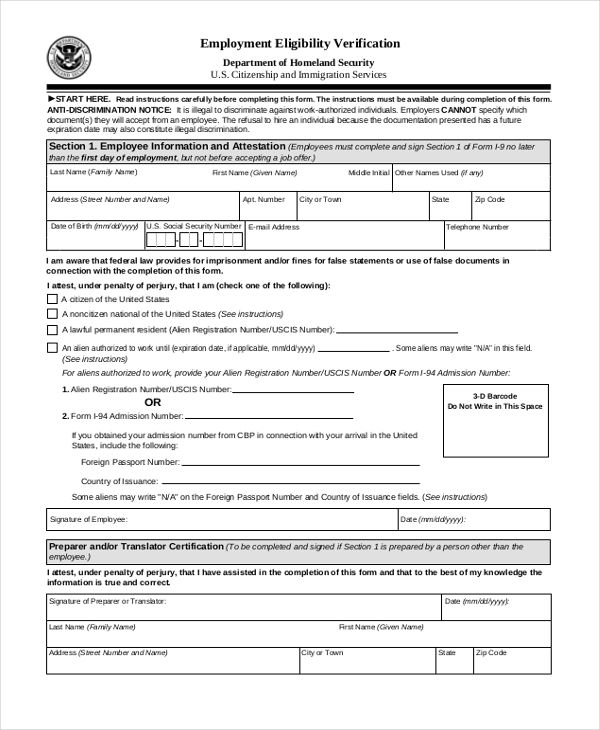 Employees too can use these forms when looking for work, usually in the case where a potential employer is interested in verifying previous employment before hiring. You can also see Tenant Verification Forms. If you like saving time, you will find these templates useful. Of course, creating them from scratch isn’t as easy as downloading them with a single click of a mouse. As such, many people often consider the option of downloading the files as opposed to creating them from scratch. Moreover, they are free to download, which means you don’t have to spend any amount of money to get these files. 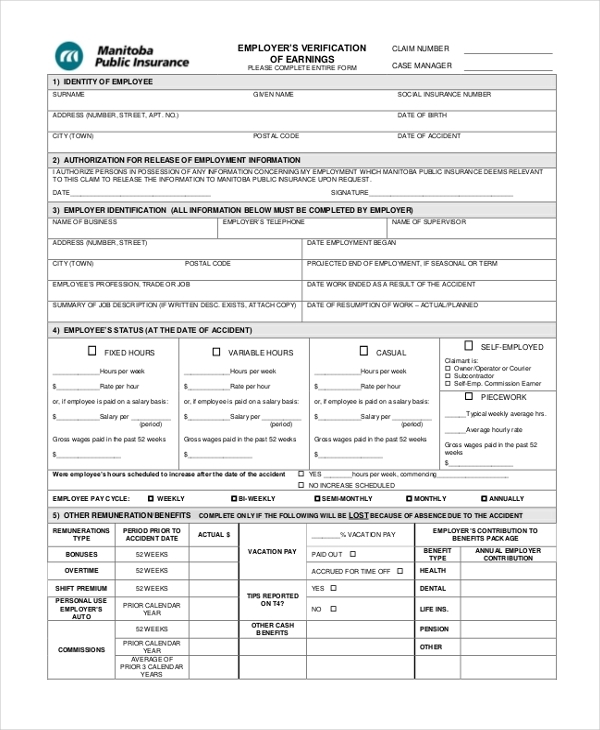 You may also see Sample Employment Verification Forms. It is important to understand that you can use these best work verification forms for different purposes in your company. Don’t bother creating the templates from scratch when you can download the template for free. In any case, these templates not only make work easier but also save you a lot of time in between. They are the best tools to add to your business arsenals.